My husband and I would highly recommend Jon Burroughs. He’s a one stop shop! His experience and knowledge of the housing market in his area are exceptional. Made buying and selling easy and quick. 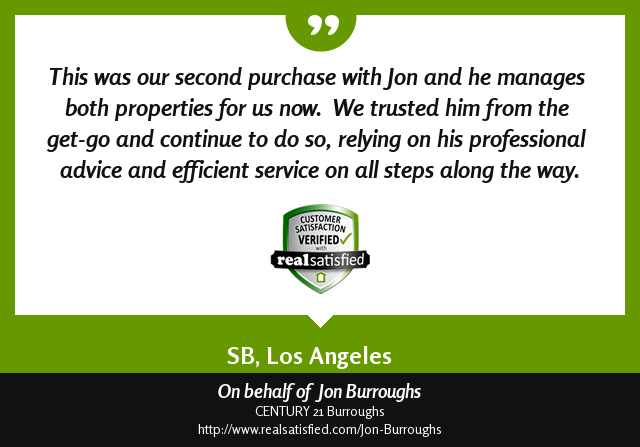 A big Thank You to Jon Burroughs and the entire staff of Century 21 Burroughs for a job well done! Jon Burroughs handled the original purchase, the management of the property and the eventual sale of the property – all flawlessly. As an out of state absentee owner, I can say that I fully trust Jon and can recommend him to perform at the highest level. - Mike G | Calabasas, CA. Jon was recommended highly by my brother. Flew in from Long Beach California, was met by Jon the following day and all went well from then until the property was mine. Much appreciated! Looking forward to repeating the process again. Jon did an excellent job dealing with previous sales contracts that were cancelled just before closing. He is efficient, helpful and informed about the ins and outs of real estate sales. I would highly recommend him as a real estate agent. When I first contacted Jon Burroughs it was after hours and he immediately responded and started sending us houses to review. From that moment I knew he would work tirelessly on my family’s behalf and find us the perfect home, which he did. Our first in person meeting with Jon it was like we have known each other for years. He is very friendly and engaging and down to earth. Not some stuffy realtor looking to just make a commission. My wife enjoyed his candid advice and the local’s knowledge of where to live and which schools are higher rated. Jon is professional, knowledgeable and second to none when it comes to the job of finding you a home. Jon easily read my wife’s reaction when we walked in the house that is now ours and said, “this is the first house that she lit up like that”, we signed a contract that day. Jon is the very best agent! I won’t buy or sell a house without him! Jon and his team were awesome to work with. With Jon’s help we listed and went under contract in less than a week. The whole process was quick and easy, and he helped us get everything coordinated for our new home as well. I highly recommend Jon for anyone looking to buy or sell a home. Thanks Jon! Century, 21 Burroughs was the current real estate company that has taken care of the property since 1998. Dennis Burroughs maintained the property and dealt with all the tenants and Jon Burroughs sold the property and did a great job! Jon Burroughs did a fantastic job in advertising and negotiating of the property. Jon kept me informed of any changes or decisions that had to be made throughout the process until the home was sold; even on the weekends. He is very professional, clear, and concise in his communication via email and phone. Jon left nothing to chance and always was a few steps ahead of the process, anticipating any issues that might arise and taking care of those. Jon is an excellent people person and was always positive over the phone and took care of any issues that could have been road blocks in the sale of the home. From the very onset, Jon assisted as with the marketing and closing of this transaction. All went very, vet), smoothly. Jon Burroughs is dependable and reliable. We knew we could count on him to answer any questions we had being miles away, we felt like we were working side by side. Jon Burroughs made the sale of our first home so easy. He listened to oar concerns, patiently explained the sales process, and was always there to answer questions that came up along the way. Thank you, Century, 21 Burroughs! Jon made the process so easy I would highly recommend him. Jon Burroughs did an excellent job on the sale, and I can recommend him without reservation as a sales agent. Century 21/Burroughs also provides excellent property management. Excellent service and communication was Jon with me. The Burroughs group were highly recommended by a family member who had previous dealings with them. Jon Burroughs ability and job performance is exemplary. TOTALLY SATISFIED! Jon took the time and care to attend to our specific needs. He answered all of our communications expeditiously. Jon gave us excellent direction to help us find the home for which we were looking. A 5-STAR RATING. We would most definitely recommend Jon for your real estate needs. They are a superb group with which to work.